This is a great dish to have on nights you don’t want anything heavy. The spices give it a pleasing kick and stop it feeling too virtuous a meal choice. Heat a large pan over a medium-high heat and add the oil. Add the onions and cook for 5 minutes, stirring occasionally. Add the ginger, garlic and spices; stir for a further 2 minutes or until fragrant. Add the carrots and stock and bring to the boil. Reduce the heat and simmer for 30 minutes or until the carrots are soft. 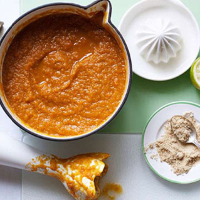 Take off the heat; carefully purée the soup using a hand-held blender. Add more liquid if it is too thick. Stir through the lime juice and salt to taste.